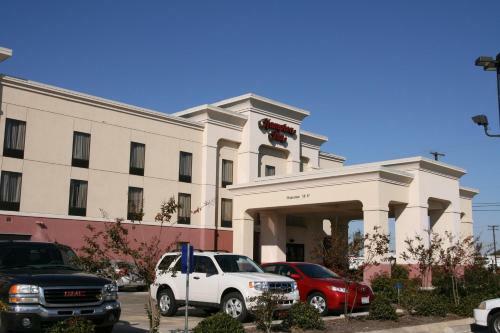 Located in Greenwood, this Mississippi hotel offers a daily buffet breakfast and rooms with free Wi-Fi. The Greenwood Blues Heritage Museum is just 3.7 km away. A spacious work desk and a seating area are provided in all rooms at the Hampton Inn Greenwood. Each room is warmly decorated and includes coffee-making facilities as well. Access to the fitness room and outdoor pool is available to all guests throughout their stay. A business centre is also on site at this Greenwood Hampton Inn. Golfing at Greenwood Country Club is just 6 minutes’ drive away. The property is 10 minutes’ drive from Florewood River Plantation State Park and 17.8 km from Greenwood-Leflore Airport. the hotel Hampton Inn Greenwood so we can give you detailed rates for the rooms in the desired period.